Mr Spicer discussed changes in US politics and, in particular, how conservatism and the Republican Party have evolved in recent decades. 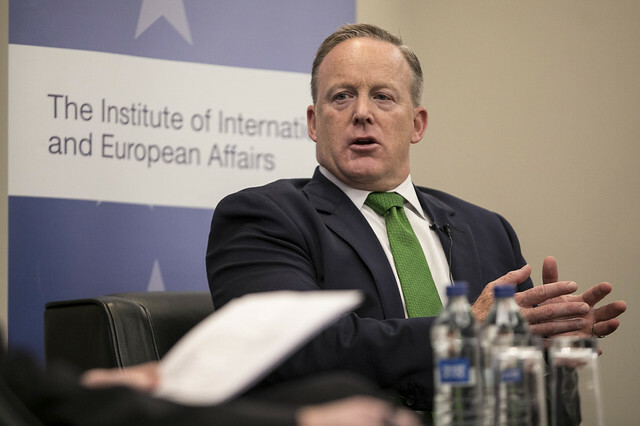 At the event, Mr Spicer discussed changes in US politics and, in particular, how conservatism and the Republican Party have evolved in recent decades. He went on to consider the presidency of Donald Trump, the areas where the foreign policy posture of the current administration is truly different from past administrations and the areas where there has been less change. Sean Spicer served as White House Press Secretary from January 2017 to July 2017. He previously served as Chief Strategist and Communications Director at the Republican National Congress (RNC) from February 2011 to January 2017. He also held a number of other senior communications positions at the Office of the US Trade Representative (2006-2009), the House Republican Conference (2005-2006) and the House Budget Committee (2002-2005). He received his BA in from Connecticut College in 1993 and his MA in National Security and Strategic Studies from the Naval War College in 2012.